Sometimes text in your documents, such as images and PDF files is not easily accessible. This is even frustrating if the document is found or searched online. Quickly translate your documents in over 40 languages while preserving the layout, font and color of the original text, thus breaking online language barriers found in content that cannot be easily translated with today's online tools. 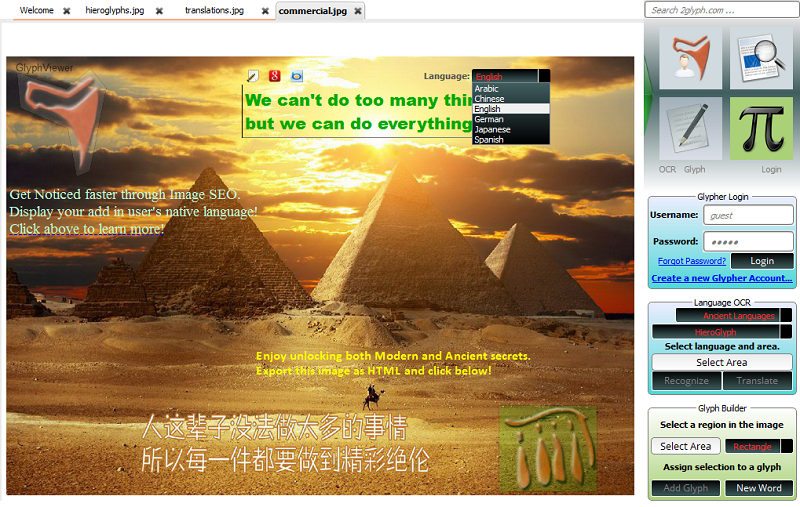 Apart from the modern language suport an unique feature of the applicatin is it's support for Ancient Egyptian Hieroglyphs, with 800+ symbols and over 10,000 ancient words for you to discover. Edit, annotate and export your processed documents to different formats, including our own HTML format to publish them online and your site's SEO rating by helping users understand your documents in their native language. Ever felt frustrated by not understanding a text in an image? Imagine browsing online on news sites or portals and while reading the text content on a page an image strikes the attention, having Chinese text in it. To most European people they are actually hieroglyphs and, while a picture can be worth a thousand words, one cannot fully comprehend the message in the image, which can actually hold wonderful secrets. GlyphViewer can help site owners to translate and export the text in the images to provide a native language content to their users and allow search engines to associate the image with that content. Have you ever been to Egypt and want to unlock the secrets of Ancient Egyptian Hieroglyphs? If you've ever been present in a temple at Luxor or Karnak the first thing that you noticed, apart from the actual size of the complex which overwhelms, is the amount of hieroglyphs on the walls, cartouches and so on. Any decent tourist starts taking picture after picture, but at one point one just wants to know what the hieroglyphs actually mean. GlyphViewer can help you translating them. To a certain degree GlyphViewer is a modern version. This site does not contain serial number, crack, keygen GlyphViewer serial number : serial number is the simplest type of crack. A serial number(cdkey,product key,etc) is register the program as you may already know. a crack or keygen may contain harmful software. If you cannot find the exact version you want, just give it a try. for more information read .nfo/.txt/.diz file include in zipped file.